Go together like a horse and carriage! Love and marriage are so much a part of our culture; "you can't have one without the other," says the song. But the reality is that marriage is an exclusive club in our country, one that not everyone can join, despite how valued it is in our society. 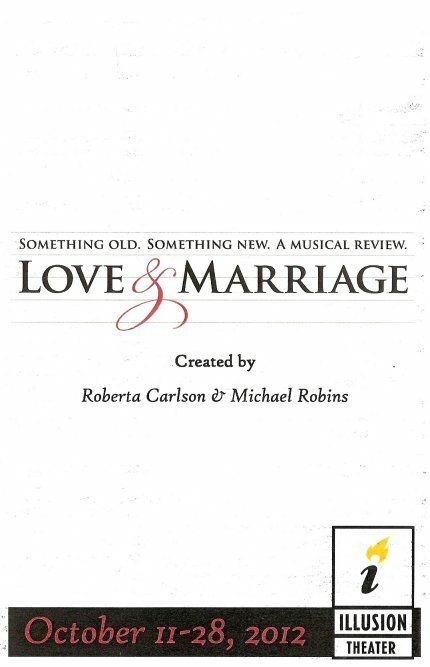 The issue of marriage equality is in the forefront right now, and Illusion Theater's new musical review, appropriately titled Love & Marriage, brings the issue to light with warmth, humor, music, and stories of over a dozen diverse real life couples. It's a fun and heartwarming celebration of love. Eight fabulous local actor/singers bring this music to life, accompanied by Roberta Carlson on piano, who created the show with Illusion's Artistic Director Michael Robins. The song list includes classic American love songs, musical theater standards, and current pop songs (or as I call them, Glee songs). Also included are a few original songs by Roberta that fit right into the lexicon of American love songs. Interspersed with the musical numbers are clips of interviews with real-life couples of all sorts - straight, gay, and lesbian. They tell their "meet cute" stories, and continue on as the show progresses to their stories of committing to each other, going through hard times, and making their relationship last. Featured couples include local celebrities such as Minneapolis mayor R.T. Rybak and his wife Megan, talented actor and singer Bradley Greenwald and his partner John, and recent Ivey Award winner Isabel Nelson and her husband (and Transatlantic Love Affair co-founder) Diogo (and now I finally understand where they got the name of their theater company). Their stories are touching, funny, and inspiring. Rising local talent Cat Brindisi sings a lovely rendition of the wistful "When I Fall in Love" and the bubbly ode to fairy tales "Happily Ever After" (Cat was last seen as Wendla in Spring Awakening, and will next be seen as Princess Amneris in Aida). Adara Bryan was in the ensemble of one of my favorite shows of the year, Park Square's Ragtime, and it's nice to see her gorgeous voice featured here, including on the Beatles' classic "In My Life" and a duet of "Truly, Madly, Deeply" with Cat. Reid Harmsen duets with Cat on one of the most charming numbers of the show, (I think I wanna) "Marry You," and with Dennis on "Wouldn't it Be Nice," as well as taking part in several other numbers (see below). Unlike most of the other performers, I've ever seen Rachel Hurst before, but she impressed on a powerful duet of "Don't Know Much," among others. Broadway vet Melissa Hart, who has made Minnesota her home, appropriately covers most of the musical theater selections, including Rodgers and Hammerstein's hopeful "It Might as Well be Spring," and the decidedly darker "Could I Leave You?" from Sondheim's Follies (which I was fortunate to see on Broadway last year). The other cast member I'd never seen before is Charles Johnson, and I was instantly mesmerized by his effortlessly smooth voice on such songs as "All in Love is Fair" and the aforementioned duet of "Don't Know Much." It's always fun to see one of my longtime faves, Randy Schmeling, here singing a couple of duets and taking the lead on "I Won't Give Up" (one of those Glee songs I mentioned). The dynamic Dennis Spears played Nat King Cole last year in Penumbra Theater's I Wish You Love. But I don't think Nat had moves like Dennis' in "We'll Be Together," or played the tambourine so energetically and seriously as Dennis did in the final number! 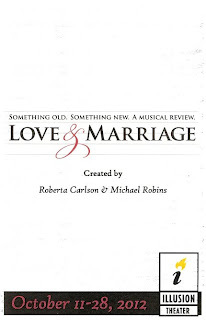 My favorite group numbers include a Sondheim song I'd never heard, "Loving You," a typically amazing Sondheim song brought to life in the beautiful harmonies of Adara, Randy, Cat, and Reid, and another Sondheim song that is quite literally about marriage, "The Little Things You Do Together" (from Company, which I will see tonight!). 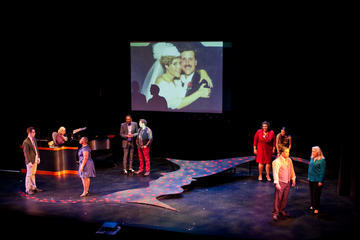 The cast sings and performs beautifully as a group, in pairs, and individually. Love & Marriage is a fun and entertaining evening of music that personalizes the topic of marriage equality by sharing the true stories of real people in our community. On November 6, my beloved home state of Minnesota will vote on a constitutional amendment that limits the definition of marriage to one man and one woman. I don't know how anyone can see this show and witness the love of all of these couples, and still vote yes on this amedment. Through music and real stories, we see the equality and validity of all kinds of love. I plan to VOTE NO on the marriage amendment (and the voter ID amendment, see my thoughts on Appomattox for more about that). Will you join me?